MBK Center is under “One stop shopping” concept which placed on a 23 rai of land which comprises of office building 20 stories, Pathumwan Princess Hotel 29 stories, and shopping center the 8-stories that operate retails business with 140,000 square meters rentable area under management of MBK Public Company Limited. The shopping center business is operated by MBK. It supplies retail space in the MBK Center Building, using the name of MBK Center. 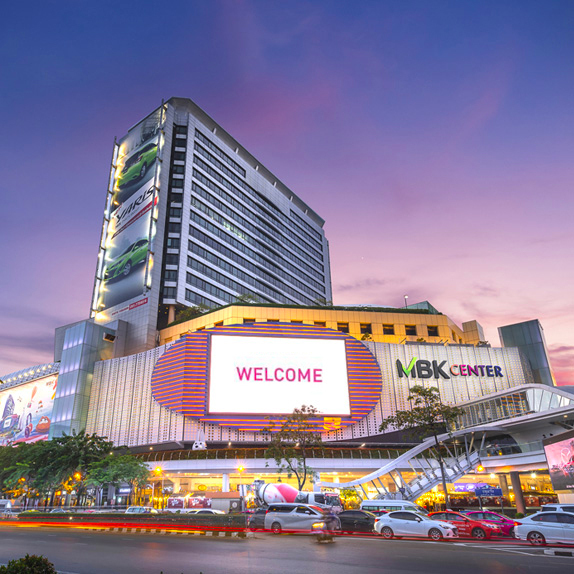 In addition to MBK Center, the Company holds 30.72% of the paid-up share capital of Siam Piwat Company Limited (SPW) which operates and manages shopping centers namely Siam Center and Siam Discovery. SPW also rents out Siam Tower office building. In addition, SPW entered into a joint venture with the Mall Group in operating Siam Paragon Shopping Center and “Paradise Park” located on Srinagarindra road. Anchor tenants which include the department store, the movie theaters, the bowling alleys, the karaoke rooms, the center for mobile phones and their accessories, the furniture center, the international food courts and bank center. The anchor tenants have been carefully selected. The Company wants to make sure that the businesses of the tenants are in line with the needs of the target market and that the tenants have a strong financial position. Retail tenants such as the retail shop. As well, these tenants have been carefully selected. The Company wants to make sure that their goods and their services are of good quality and varieties. Customers and people who buy things in the shopping center which include the group such as student, working person and tourism.